TOKYO -- With an eye to profiting from humankind's final frontier, Japanese construction giants are developing ambitious space technologies to supplant the Olympic building boom. And some of their projects are simply out of this world. In February, an odd looking device was seen rolling around a highway construction site on Japan's southwestern island of Shikoku, stopping regularly to examine soil hardness. The machine was actually an autonomous rover, the product of a collaboration between Takenaka, one of the nation's largest contractors, its subsidiary Takenaka Civil Engineering & Construction and the Japan Aerospace Exploration Agency (JAXA). Designed for exploring the moon and Mars, it is currently being tested to see if it can collect samples for space-based engineering and construction projects. A prototype of the rover, dubbed Kenage, was developed in 2014 by JAXA and Ono Denki Seisakusho, a Japanese machinery manufacturer. It was able negotiate 30-centimeter obstacles and climb 45-degree slopes, but obviously lacked the capability to traverse more rugged terrain like the rocky, pockmarked surface of the moon. That's when Takenaka stepped in. The original developers hoped to leverage the company's expertise in platform cars commonly used at construction sites to advance their goals. Now, the rover has been equipped with ultrasonic sensors and GPS in order to detect and avoid obstacles, thus improving mobility over treacherous landscapes. Testing is also underway at different places around the world to assess the machine's terrestrial capabilities, as the developers would like to exploit more down-to-earth opportunities. "We hope technologies designed for space can also be used for our earth-based business," remarked Masahiro Sugata, a researcher who heads the new production systems unit at Takenaka's Research & Development Institute. Currently, the biggest challenge still facing project engineers is making a rover that can deal with unexpectedly formidable obstacles. One idea is to integrate multiple robots into a single machine. The trials in Shikoku proved that the rover can reduce soil inspection times by 15%. JAXA hopes to have a fully functioning version included on its moon missions slated for early next decade. The idea of exploiting outer space for profit began in the free-spending days of Japan's bubble economy in the 1980s. At the time, some construction companies unveiled otherworldly plans, such as Shimizu's space hotel and moon base -- projects that were laughed off as little more than sci-fi dreams. Since then, new capabilities acquired from participation in numerous infrastructure projects as well as advances in information technology have made spaced-based business a distinct possibility. Corporations involved in space projects also want to apply the fruits of their labors to infrastructure on earth. Takenaka believes its autonomous moon rover can be used for inspecting road bridges, many of which have complex inner structures that are time-consuming to check. The company is banking on robots to generate substantial savings in time and manpower when used for similar tasks. 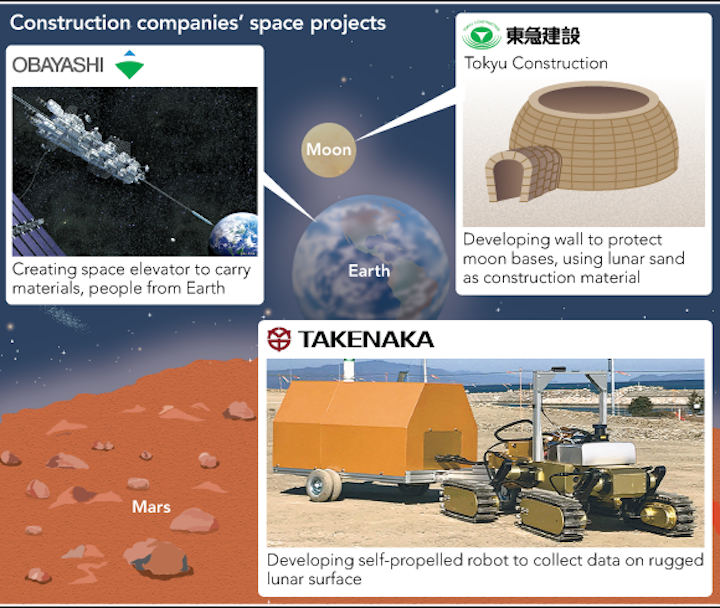 Another large Japanese contractor, Tokyu Construction, is developing technology for manufacturing bricklike construction materials on the moon. Since any moon bases would be exposed to meteorites and high levels of radiation, the company figures that lunar facilities would require walls at least 10 meters high for protection. Launching materials from Earth to construct these walls would be impractical, hence the need for this futuristic technology, which would use sand mined from the lunar surface and a minimum of Earth-based materials to make the bricks. Tokyo City University and Nitto Seimo, a fishing-net manufacturer, have joined the project, which launched last year and involves nearly 20 engineers and researchers. The team has been mixing lunar sand obtained from JAXA with materials found on Earth in order to find just the right blend. They anticipate a solution by late March. Like Takenaka, Tokyu hopes the new technology can be used for more earthly applications.